When I saw this soft buff cashmere coat for $1, I couldn't resist. Too petite for me, too frumpy for my sister, too damaged for resale--it's hung in my closet for months. I decided to "use it up" last night. I took apart the large pieces of cashmere, tossed the glossy metal buttons in the button box, and folded the silky lining for later. The pockets, turned inside out and cinched with ribbon, will make nice little jewelry pouches, I think. Taking apart its vintage glamour gives me a big idea for my closet makeover. Me too, I've missed your posts! Count me in with the others that are glad that you are back. You have been missed and prayed for. Waiting to see how the closet comes out. I had to laugh when you talked about wanting to be your daughter's role model for womanhood! Why laugh you ask? I have a daughter too and felt the same way when she was little. What a surprise to find out that she was very much a tom boy and enjoyed watching football with her dad while her older brother and I made the cookies!!! Sometimes God is just too funny! By the way, she is now in her 30's and still the tom boy of the family watching football while her husband now makes the cookies!! Okay, cracking up at Lynn Marie's comment. So TRUE!!!! I can't live without my tube socks. But, I make up for it in other ways to be feminine. I try to keep vases with fresh flowers in the house each month. I try to save manly chores for my hubby. (Although since my dad worked as a plumber, I usually am the one to fix the toilets). Nice to see you back, Meredith! And those pockets, I would never have thought to take advantage of the lining and shape to make jewelry pouches. I like the silky gold vanilla sachets! I make "room spray" with a spray bottle of water and essential oils, and sometimes I add vanilla. Mmmm! Meredith- So very nice to see you are back and what lovely posts! I have been checking in all week hoping to "hear" from you. Hope this means everyone is healthy at home! I do want to add- I agreed with the post- have felt that way myself many times and wanted to thank you for the link you gave with it as I found it was very well written. You are a blessing. Keep up the frugal blogging- I LOVE it! Yes...good to check Bloglines and see you there. I did the same thing to a favorite wool, green coat many years ago. I used some of it to make Christmas stockings (it was dark green...perfect color). The rest of it is still in my hope chest to use another time (I think...). I've done the same thing with a coat I inherited from my grandmother. 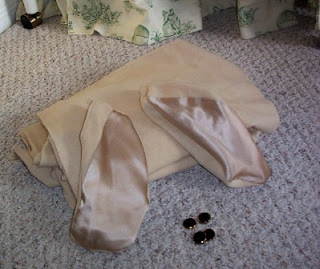 This one was a dark brown, very nubby tweed with a fur collar, silky lining and jeweled buttons. I make pillows so these are all going into pillow projects of some sort. Thanks for the many posts. I learn and laugh when I'm visiting. ALso, you are an inspiration in many ways.